Here’s my list of favorite places to dine on the water near the Inlet. My hope this summer is to have the opportunity to dine at every one of them. They are each unique and wonderful. 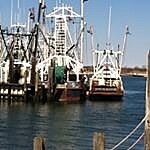 Whether you want to time seeing the sun set, watch the giant fishing boats come and go, feel the breeze on your face, smell the salt water, or enjoy the freshest seafood, here are my top picks for dining on the Manasquan River, both on the Brielle and Point Beach sides. 1. Waypoint 622 is a gorgeous restaurant with outdoor dining and a huge outdoor bar on the Brielle side of the Manasquan River. The former Union Landing, it has been remodeled and the outside deck and bar area have been expanded. Your view is the Point Pleasant drawbridge and a wide, sweeping view of the Manasquan River, marina, and boats going by. No more BYOB, as they are serving their own liquor. No awning for outside dining. 2. The Wharfside in Point Pleasant Beach. This is one of my long-time favorite places for outside dining on the water. They have a separate outdoor Patio Bar with live music in the summer that is separated just enough from the restaurant that you can have one without the other. The view of the Manasquan River is gorgeous, and the outside restaurant area has an awning so that you are shaded. 3. The Shrimp Box in Point Pleasant Beach has a great outside dining area with a smaller view of the inlet area where some of the giant fishing boats going by. The food is awesome, and, some nights, if you’re lucky, you can see some of the fireworks off of Manasquan or Point Beach. There is an awning. 4. Red’s Lobster Pot is more casual and it’s not always easy to get a seat on the deck, but if you do (especially near the end of the deck), you will be treated to one of the most stunning sunset views over the Manasquan River…and the seafood is awesome. (No awning in the area closest to the inlet). 5. Brielle River House is also a beautiful outdoor dining experience on the Manasquan River. It’s a little more upscale than some of the more flip-flop, straight-off-the-beach places. But a great afternoon or evening on the water with fantastic dishes. No awning in the area closest to the water. The Sand Bar in Brielle is on the water but does NOT have outside dining. Shipwreck Point is on Inlet drive, but its only view is of the parking lot next to the inlet…and it does not have outdoor dining. There are also some places in Manasquan and on the Jenkinson’s Boardwalk near the inlet where you can sit in an outdoor cafe near the inlet, grab a burger and a drink and sit under a tiki umbrella overlooking the beach near the inlet, or just grab ice cream and watch the boats go in and out of the inlet. Have you been to all of these? What are your favorite places to dine outside on the water?